Jim (Edward James) Gilbert was born in Old Amersham in a cottage opposite Bury Farm in 1897. He was the youngest of seven children, five girls and two boys. His father, James, was employed as a drayman at Weller’s Brewery in Church Street, Amersham, and he delivered beer all over the county, sometimes beyond. His mother was Georgina Porter from Little Kimble prior to her marriage. They were a happy little family but when Jim was only two years old his mother died at the age of 38. His father (see 1899 photo to the left) was great, cooking and cleaning, looking after his children acting as mother as well as father. When young Jim was nine years old an accident took place on the dray at Sly Corner, The Lee. It was often difficult for draymen to avoid nodding off to sleep on the dray due to the monotony of the plod of the horse’s hooves and the fact that draymen usually started work at 6 am. Jim senior succumbed and nodded off, fell in between the shafts of the dray, the front wheel went over his head, killing him instantly. The seven orphaned children brought themselves up, one acting as a little mother and the elder boy Harry (see 1912 photo to the right) took a great responsibility as the boss or little father and found it necessary to keep the younger children in order. This irritated Jim so that one day he said to his sister Mary, with his usual lisp, “I know a plan – leth kill Harry”! The older girls went into service sending money back to keep the younger siblings, and Harry took over two allotments to provide food for the family. 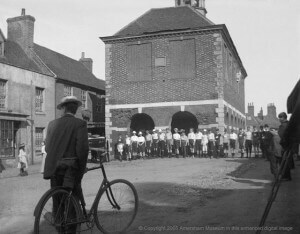 The arrangements worked remarkably well – they all grew up to be good, solid citizens of Amersham. August 1914 and the First World War began. A Sergeant had set up a recruiting table under the Market Hall where Jim and Harry both volunteered. Jim, who loved horses, joined the Royal Horse Artillery at the age of 17 and served in France and Salonika. Jim was not good at writing letters and in Salonika, a Captain Swan sent for him to ask when he had last written home as his sisters were concerned about him and had been making enquiries at the War Office as to his welfare. The Captain gave him a card and told him to write home at once. Shortly afterwards his sister Mary received the card which bore the words “Deare Mare, am well, love Jim”. “Mare” was his nickname for his sister. On his return in 1918 Jim worked at Whitesides in Amersham as a Baker’s roundsman. (Perhaps the photo above shows him?) He came third in the Amersham Marathon in 1920 after doing his baker’s round (listen to recording below). He also worked at Rushymead for a soldier he had been with in Bulgaria. He worked at Halton Camp for the Canadians and in later life he was a chauffeur to a gentleman who lived at Chesham Bois. His first marriage failed, but he married again in the 1930s and in all he had four daughters, two of whom served as Staff Nurse and Sister at Amersham and High Wycombe Hospitals. Jim, a keen member of the British Legion, joined the local Home Guard at the beginning of the Second World War. He loved Buckinghamshire and Amersham and spoke with the lovely rich old Bucks dialect and would often enjoy telling stories at the British Legion bar. When asleep in his armchair at home, the best way to rouse him was to say “The British Legion is on fire” ! Jim died in 1996 at the age of 99 and with him went the source of many stories of the Old Amersham of years past, all told in that rich Bucks dialect.